The axolotl is a medium-sized amphibian that as suggested by its other common name, originates from Mexico. It's a unique creature with many weird traits, including its bizarre appearance, the ability to regenerate lost limbs and the fact that it exhibits a phenomenon known as neoteny or paedomorphosis. The latter means that the species fails to undergo the metamorphosis process. As a result, adults usually don't give the impression of a typical adult salamander and are strictly aquatic animals. As you can see on the image above, the species is easily distinguished by the external branch-like structures protruding on each side of the head. Each side has three protrusions, covered with feathery filaments that increase the surface area for gas exchange. The species is not to be confused with the ajolote, the common name used for Bipes biporus. Adults have a varying length, ranging from 15 to 45 cm (~6-18 inches), with the average length being 23 cm (~9 in.). Normally, adults are dark in color, either with varying shades of brown (usually with spots) or melanoid (black). There are also two mutant colors that have been created in captivity, leucistic (pale pink with black eyes) and albino (golden, tan or pale pink with pink eyes). Males can be distinguished from females by their swollen cloacae which is lined with papillae. The head is wide with lidless eyes and the limbs are underdeveloped with long and thin digits. 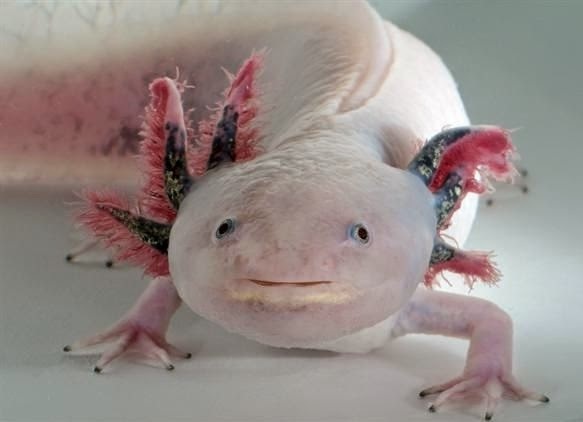 Since axolotls fail to undergo metamorphosis, they retain their gills and have three pairs of external gill stalks (also called rami) just behind their heads. They also have four gill slits (lined with gill rakers) that are hidden below the external gills. The external gills are primarily used for respiration, although they are also used for buccal pumping (gulping air from the surface) as an alternative way to provide oxygen to the lungs. Axolotls have a caudal fin ranging from head to vent. The teeth are vestigial and practically non visible. Axolotls typically reach sexual maturity once they are 18-24 months old and can live to be at least 10-15 years old. A specimen in Paris was reported to have reached the age of 25 years before dyeing from natural causes but most sources give a maximum lifespan (in captivity) of 17 years. Axolotls are carnivorous and use their smell to find prey, snapping anything that might be considered to be a meal and sucking it with vacuum force. During the suction, the axolotl's rakers interlock to close the gill slits. Axolotls are primarily preyed upon by herons. It can take anywhere from a minimum of 12 months to many years for an axolotl to reach sexual maturity. This period depends on many factors, including quality and quantity of food, water temperatures, general habitat conditions etc. During mating, males 'dance' to initiate courtship and nudge the female. Next, males release their cone-shaped spermatophores inside the water, onto rocks and plants and then females take them up. Fertilization occurs internally and about 24 hours later, females lay 200-600 eggs on plants. The eggs take about two weeks to hatch. After hatching has occurred, the younglings remain attached to the plants for an additional two weeks. Then, they begin to swim in search for food. At first they eat algae and gradually begin eating aquatic invertebrates. In the wild, Axolotls breed once a year, from March to June. As aforementioned, Axolotls have a strange property known as neoteny. This means that unlike other salamanders, they reach sexual maturity without undergoing the stage of metamorphosis. Scientists believe the axolotl's neoteny occurs due to the lack of a thyroid stimulating hormone. When this hormone takes action, it induces the thyroid into producing another hormone called thyroxine, which is responsible for a salamander's metamorphosis. It has been found that axolotls do metamorphosize when injected with the iodine or thyroxin hormone. There is also one more method to induce transformation, however it has a very small chance of success. In this method, a healthy axolotl is first placed in a shallow tank, with the water being gradually and slowly reduced so that the axolotl finds it difficult to submerge and thus breathe. However, in most cases the individual simply dies. If it manages to survive this process, the animal gradually and simultaneously metamorphosizes and after a few weeks the process is complete. During this time, the air must always be moist, and the axolotl has to be periodically sprayed with a fine pure water mist. It should also be noted that artificially metamorphosized axolotls have a shorter life span, rarely reaching the age of 5 years old. Metamorphosized axolotls look a lot like adult Tiger Salamanders (Ambystoma tigrinum), something expected as they are members of the same genus. All aforementioned methods put a lot of stress in the animal, have a low success ratio and commonly result in death before the process is complete. Like other salamanders, axolotls have the capacity to regenerate greatly damaged or even lost limbs. They can even accept transplants from other individuals with relatively small risk of rejection. Eyes, segments of the brain and other vital parts and organs have been successfully transplanted in the lab. There are also a few recorded occasions in which after a limb was damaged, axolotls not only managed to regenerate it but also grew an extra one! For unknown reasons, metamorphosed axolotls have a hindered regeneration capacity. Axolotls are endemic to Lake Xochimilco and Lake Chalco, both located in central Mexico. Unfortunately Lake Chalco has long been artificially drained and only a handful of canals now remain. As for the populations in the Lake Xochimilco, they are continuously declining due to the ongoing urbanization of Mexico City and the consequent pollution that is produced. Unfortunately, urbanization and pollution are not the only factors endangering this strange animal. In the past decade, various non-native fish species (e.g. African tilapia, Asian carp and other) have been introduced to the waters the species inhabits. These new types of fish not only antagonize the axolotl for food but also eat its younglings. Today, the species is listed by the IUCN as critically endangered, with a declining trend. In other words, the species is near extinction. If things continue to take the same route, no wild populations shall remain. Actually, a four month long search in 2013 found no surviving individuals in the wild. Previous surveys in 1998, 2003 and 2008 had found 6000, 1000 and 100 axolotls per square kilometer in the Lake Xochimilco habitat, respectively. However, wild-caught animals are still found in the local market, indicating that local fishermen still know where to find them. Maybe the damage has long passed the irreversible stage. It's highly possible that in a few years the species will only survive as a pet, a zoo attraction and a lab animal for human experimenting. Axolotls are a popular strange pet and getting one won't be very difficult as they are casually sold both by commercial and independent breeders. However, I urge you to first learn everything there is to know about keeping them healthy and happy in an aquarium. 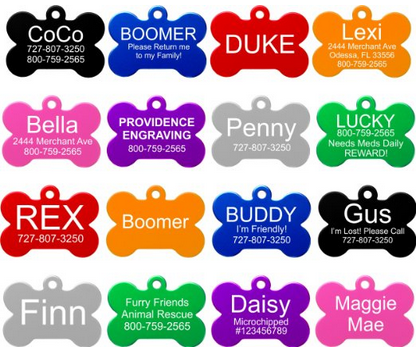 There are many sites and forums dedicated to them, so it won't be difficult to educate yourself before buying one. 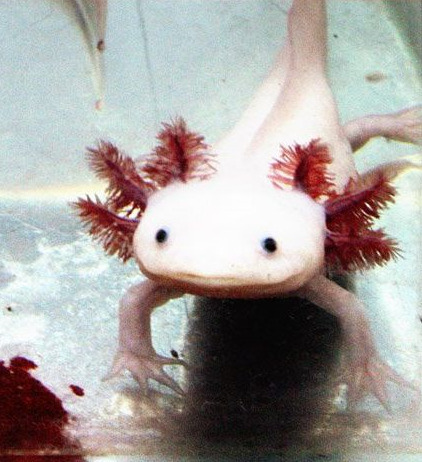 A very good site with many resources and frequently asked questions about these little critters is Axolotl.org. Axolotls are edible and are occasionally consumed as a substitute for fish. They are prepared by either roasting or boiling and the tail is eaten with vinegar or cayenne pepper. They have also been used for medicinal purposes. - The species is many times confused with waterdogs. 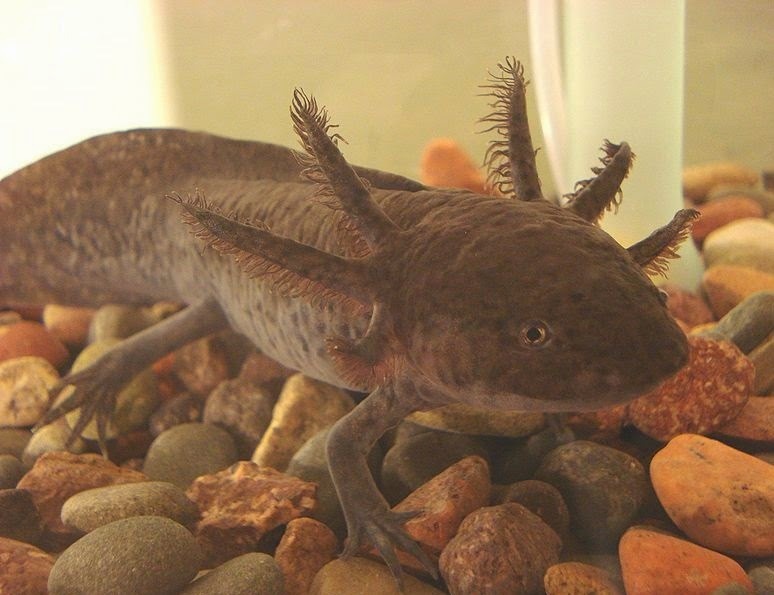 Waterdogs are the larval stage of the closely related tiger salamanders (A. tigrinum and A. mavortium), which are widespread in much of North America and occasionally also become neotenic. Neither should it be confused with mudpuppies (Necturus spp. ), a genus of strictly aquatic salamanders which although not closely related, bear a superficial resemblance. - Axolotls are an important research animal and have been heavily studied in the regulation of gene expression, embryology, neurobiology, and tissue regeneration. - Brandon, R.A. 1989. Natural history of the axolotl and its relationship to other ambystomatic salamanders.. In: J.B. Armstrong and G.M. Malacinski (eds), Development Biology of the Axolotl, pp. 12-21. Oxford University Press, New York. - Griffiths, R.A., Graue, V. and Bride, I.G. 2003. The axolotls of Lake Xochimilco: the evolution of a conservation programme. Axolotl News 30: 12-18. - Jones, C. 2002. Water quality model for the reintroduction of the axolotl (Ambystoma mexicanum) into the canals of Xochimilco, Mexico City. Undergraduate Honours theses, Trent University Peterborough, Canada. - Luis Zambrano, Paola Mosig Reidl, Jeanne McKay, Richard Griffiths, Brad Shaffer, Oscar Flores-Villela, Gabriela Parra-Olea, David Wake (2010). "Ambystoma mexicanum". IUCN Red List of Threatened Species. Version 2013.2. International Union for Conservation of Nature. - Mattison, C. 2005. Encyclopedia of reptiles and amphibians: An essential guide to reptiles and amphibians of the world. Grange Books Plc. Kent. - Smith, H.B. 1989. The axolotl in its native habitat. 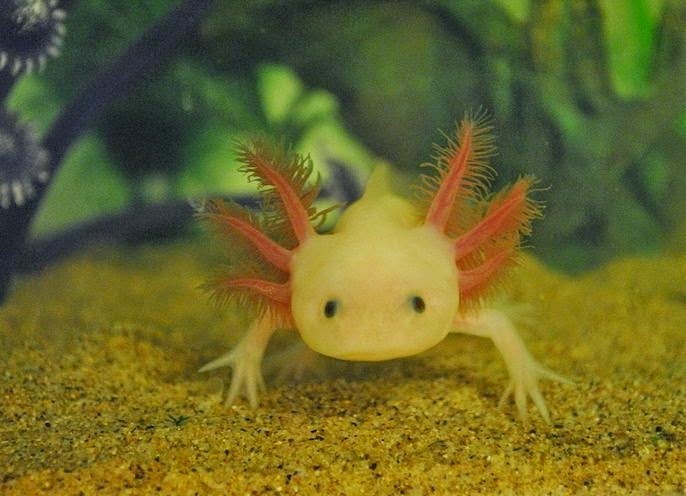 Axolotl News 18: 12-17.
oh god that is cute! SHINY WOOPER!! !